Asynchronous, the team of the Polytechnic University of Valencia (UPV) composed of the students Pablo Marino Velasco Pla (Higher Technical School of Industrial Engineers) and José Pablo Ferrer Báguena (Higher Technical School of Design Engineering), and Professor Carlos Roldán Porta (Department of Electronic Engineering), has won the first SIMARIS Design challenge, convened by the multinational Siemens. 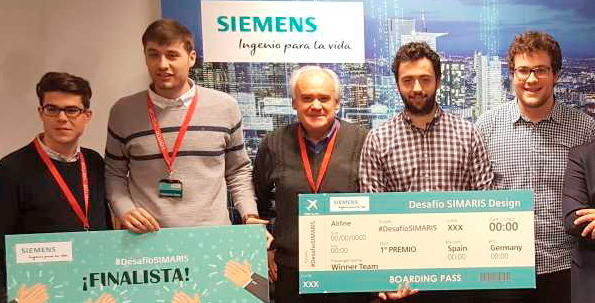 The contest, which had as its objective the elaboration of an electrical network project of a facility using Siemens design software, SIMARIS Design, has celebrated its final phase at the company’s headquarters in Spain, located in Tres Cantos, where they have faced the 8 teams that overcame the online qualifying phase, which took place from 10 to 25 November last year. The final has been sponsored by Ana Campón, financial director of Siemens Spain, and Juan Miguel Pérez de Andrés, general manager of Siemens Energy Management, the division responsible for this design software. Both have coincided in the quality of the work of the students and the philosophy of Siemens to reward the talent of its employees and to seek the best new profiles of the market to join the company. The prize for the winning team is a three-day trip to the Total Integrated Power (TIP) center in Germany. There, they will meet the developers of SIMARIS applications and assist in the use and implementation of Siemens solutions for energy distribution using SIMARIS Design software. Likewise, Siemens Spain will offer the two winning students the possibility of professional internships in one of the company’s centers. The participating universities have also received a user license for SIMARIS Design in its professional version. In addition to the winning team, the UPV has had another presence on the podium of the competition, as the jury of the contest has recognized two other finalists, M & A, formed by Alejandro Martín Barreales and Manuel Moreno González, students also of the UPV tutored Carlos Roldán, and Industriales 4, a team made up of Carlos Sánchez Núñez, Javier López Ortiz and Professor Rosa María de Castro Fernández, belonging to the Higher Technical School of Industrial Engineers of Madrid. The SIMARIS Design Challenge was aimed at undergraduate or master university students who were studying a subject related to electrical installation projects. The teams had to be constituted by two students and by a professor of their university, in representation of the university center in which they were enrolled.